If you've landed on this page in search of the perfect assortment of compact picture holders for your office or home, you've struck gold. 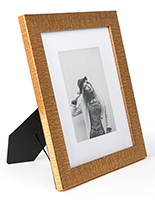 This selection of small gold picture frames will protect and display your favorite photos with a palatial touch for a price that you don't have to be a king or queen to afford. Whether you need a mini 1.5" x 2" frame for your anniversary photo in the living room, or a 5" x 7" frame to display pictures of the resort in each hotel room, this page has the frames to meet your needs. For small paintings and pieces of two dimensional art, many framers choose an ornate edging, engraved and carved to help bring the artwork to life. The lustrous gold frame brightens the paintstrokes, especially enhancing imagery of sunflowers and sunsets. These frames are perfect for hotel rooms, massage therapists, flower shops and any other business trying to portray elegance for their guests. On the other hand, for photographs, many choose a simple, solid gold edging as to not take away from the faces in the photo. A brushed aluminum frame is the perfect surrounding for a black and white couples photo, or that perfect moment captured from the wedding ceremony. 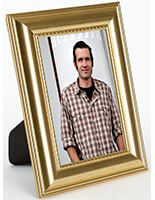 Do you need the frame to mount in a portrait or landscape position, and will it be supported by an easel on a counter or on the wall? The location and placement possibilities of these gold frames are endless, but make sure that your purchase includes the hardware required to position the frame where you need it, whether they will be lining the wall staircase or propped up on the receptionist's desk. 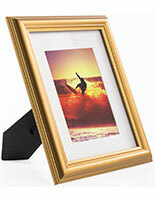 Do you need a matted frame? 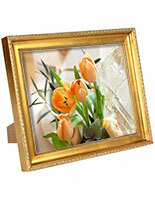 A gold frame with an included mat helps to both protect the picture from condensation, as well as provide a dual colored surrounding to focus the center of the picture. A white mat with an affordable polystyrene outer edge adds a rich sophistication into what would otherwise be a basic framing design. What material should the gold frame be made out of? The selection here offers a variety of materials. From affordable, lightweight polystyrene to shining aluminum, and engraved wood, you'll find the material that complements the design of your room - whether it's a traditional or contemporary style.